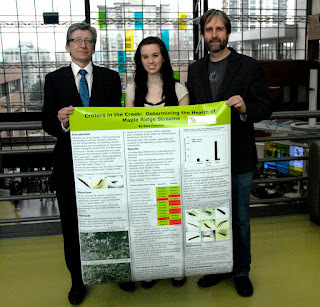 Kara Foreman holding up her winning research project for Student Research Day flanked by Douglas College President Dr. Scott McAlpine (left) and Dr. David N. Wright (right), Coordinator of the Research and Innovation Office at the College. For one day in March, students take over the New Westminster Campus concourse to present the findings of their research undertaken as part of a class project or for their own interest. Student Research Day is an opportunity for students to get out of their comfort zone and tackle challenging, controversial or difficult topics with a personal twist. This year, one student stood out. Kara Foreman took home the President’s Award for Best in Show (worth $300) as voted on by the students, faculty and community members in attendance at Student Research Day for her project on salmon-bearing streams in her hometown of Maple Ridge. She also won the TD Bank Financial Group Award of Distinction – and with it, a cool $500 - for her efforts. The top three President’s Prize for Best in Show all had an environmental focus, with the second and third place finishers examining hemp as a green alternative for industry and looking at the impacts of electronic waste, respectively. Events like Student Research Day give us the opportunity to showcase the outstanding research work underway across all faculties at Douglas College. “Student research is about merging classroom learning with student engagement,” said Douglas College President Dr. Scott McAlpine. “It is about our students discovering for themselves not only something about their subject matter, but something about the world we live in." Nearly 200 students and 80 research projects were displayed this year and planning is already underway for next year’s event, which will take place March 25, 2013. We hope to see you there!